Most recent items shown first. The timetable for local elections in PDF format, as published by the National Association of Local Councils, can be viewed using this link. Relevent to this year since local elections are due in May. Next Meeting: Friday, January 25th, 2019 at Wingfield Barns starting at 7.30pm. Cone Tree Nursery (DC/18/04238): Conversion of barn into guest accommodation. Next regular PC meeting: Friday 1st June - AGM. This year we will have two vacancies on the Parish Council created by our esteemed Chairman, Mike Allmey (instigating his own Mikexit), and the untimely death of David Jenvey last year. 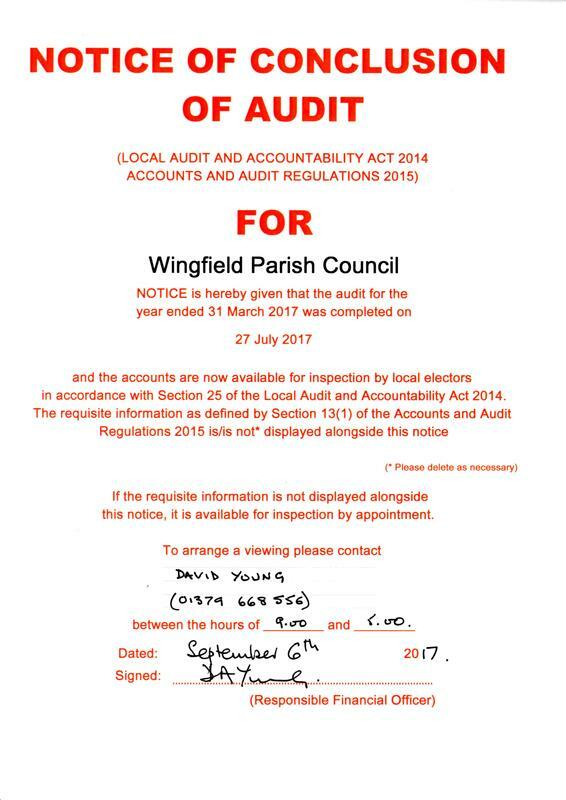 If you would like to fill one of these vacancies, please contact the Parish Clerk. This is an opportunity to serve the community and help shape the future of the village. The Parish Clerk is pleased to announce that nothing has been discovered. Again. A Sustainability Appraisal is available for consultation alongside the Babergh and Mid-Suffolk Joint Local Plan: Consultation Document (August 2017), upon which comments are also invited. The base document is tricky to find, so a copy (dated August 2017) can be opened directly from ﻿here﻿. The complete set of related documents are listed and downloadable from the MSDC site here. Point of interest: Wingfield, it is suggested, will be redesignated upward from 'hamlet and countryside' to 'hinterland village'. Amongst other things, that potentially means that the village will have to absorb not 5% of the projected housing growth, but 15%. Planning Application for erection of new pig building Bullocks Hill Farm North, Pixey Green, Wingfield, Eye, Suffolk IP21 5NG. Use this link to download the request for comments from MSDC. 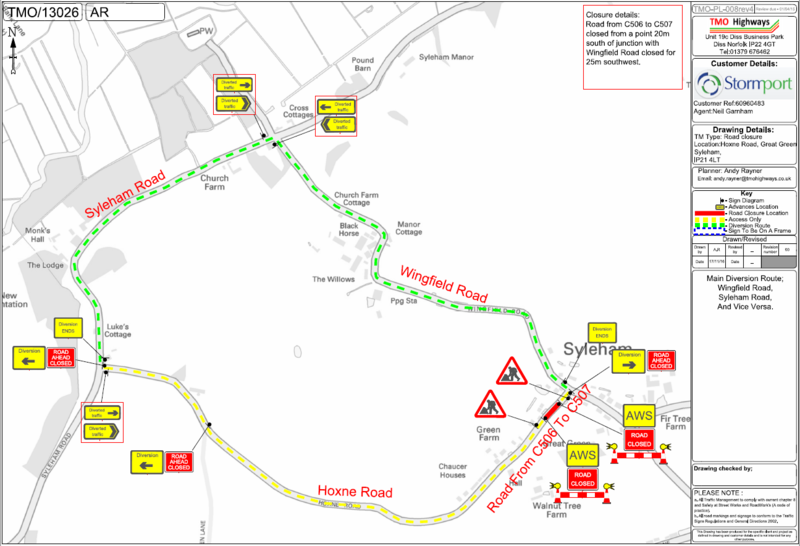 Temporary Traffic Order (road closure) in Syleham between 26/6 and 30/6 with associated diversion. Map and letter from here and here. 7.30pm, 19th May, 2017 at Wingfield Barns, Studio 4. Is Wingfield Green a mess or as it should be? At the risk of opening a can of worms, there have been a number of suggestions over the years as to how the Green could be better utilised or maintained, but these have come to nothing for a variety of reasons, none of them under the control of WPC. The basics need to be made right first - should the scrub be pushed back, should topping be carried out, should more grazing be allowed, should the lost mere be properly re-instated, should…? 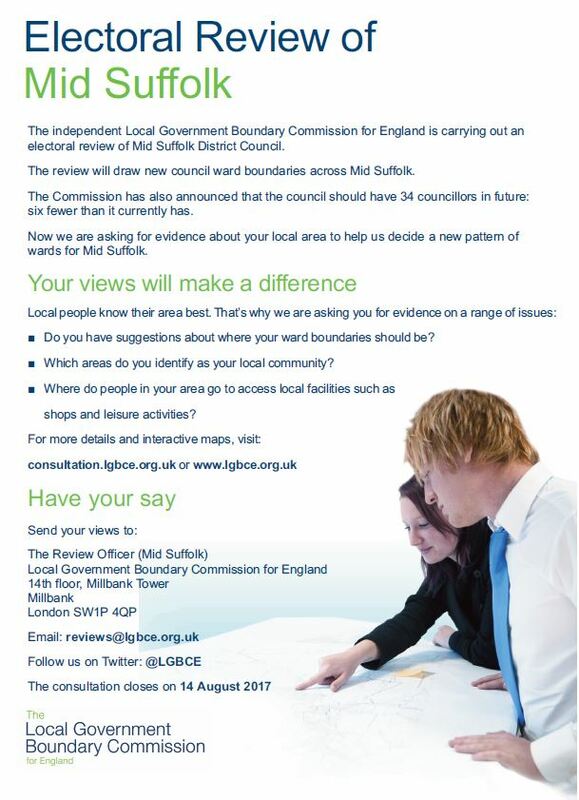 If WPC could gauge where local opinions are on these matters then we might be able to more effectively apply pressure to get things - anything - done. No cans of worms though, please - just drop a line to David Young at clerk@wingfield-pc.org.uk. During the December WPC meeting it became very clear that there has been something of a crime wave taking place in Wingfield and Syleham over the last few weeks. In absolute terms the numbers are tiny, but since the starting point was effectively zero then the percentage increase in incidents is huge. In the absence of a formalised Neighbourhood Watch Scheme, the Parish Council are asking residents to contact the Parish Clerk with any reports of suspicious callers, people, vehicles… even Webslave will be asking himself some pretty searching questions as to his whereabouts last week as soon as you’ve stopped reading this page. Break-ins to sheds and garages seem to be popular at present and there have been a number of separate sightings of lurkers and unexplained vans in driveways. It seems that the only way the Parish can arouse any interest from Suffolk Constabulary is to present a joined-up set of sightings and supporting information - hence our decision to use the Parish Clerk as our central point of contact. Christmas bin collections - download PDF from here. 2017 bin collections - download PDF from here. Meeting open for residents to raise matters of concern. 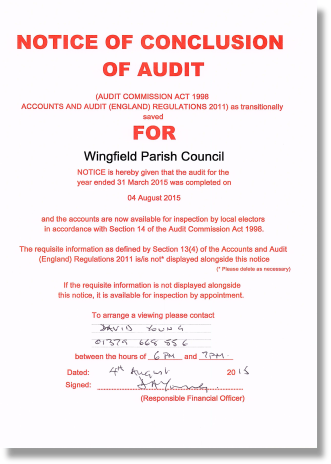 The next Parish Council meeting will be held on 2nd December 2016, 7.30pm at Wingfield Barns in Studio 4. The next two meetings of WPC have been scheduled for Friday 7th October and Friday 2nd December, both at 7.30pm in Gallery 4 of Wingfield Barns. Have you spotted the new Yellow Thing in the Crescent? The next Parish Council meeting will be held in a venue and on a date to be announced. NEW ARRIVALS: There will soon be a new bench located near the notice board and - how long have we waited for this? - a sand grit box in Castle Crescent. NEXT MEETING: The next WPC meeting is planned for Friday 12th August at 7.30pm in Studio 4 of Wingfield Barns. Agenda will be posted a few days in advance both here and on the notice board. The Parish Clerk is pleased to report that nothing has been discovered. Again. WPC’s Accounts are open for viewing by anyone wishing to do so by appointment.